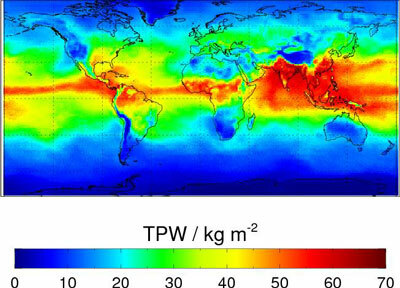 The CM SAF ATOVS data set offers 13 years (01 January 1999 - 31 December 2011) of water vapour and temperature satellite-derived global products. Different parameters generated simultaneously are available: vertically integrated water vapour (kg/m2), vertically integrated water vapour (kg/m2) and mean temperature (K) in 5 layers, specific humidity (g/kg) and temperature (K) on 6 levels. Also available are number of valid observations and an uncertainty estimate. The data set was derived from ATOVS onboard the NOAA satellites, NOAA-15, NOAA-16, NOAA-17, NOAA-18, NOAA-19 and onboard the European Metop-A satellite. ATOVS is composed of three instruments: HIRS, AMSU-B/MHS and AMSU-A. After application of a kriging routine, the products are available as daily and monthly means on a cylindrical equal area projection of 90km×90km. Grid information is given for centre position. Layers are (hPa): 200-300, 300-500, 500-700, 700-850, 850-surface. Levels are: 200, 300, 500, 700, 850, 1000 hPa. Products covered by this are: Vertically integrated water vapour, Layered water vapour and temperature , Specific humidity and temperature at pressure levels from ATOVS. This is a Thematic Climate Data Record (TCDR). The assigned DOI for this dataset is: 10.5676/EUM_SAF_CM/WVT_ATOVS/V001. The CM SAF Fundamental Climate Data Record (FCDR) of SSM/I and SSMIS brightness temperatures covers the time period from July 1987 to December 2013 including all available data from the six SSM/I radiometers aboard F08, F10, F11, F13, F14, and F15 and from the three SSMIS radiometers aboard F16, F17, and F18. It provides homogenised and inter-calibrated brightness temperatures in a user friendly data format. SSM/I and SSMIS data are used for a variety of applications, such as analyses of the hydrological cycle and related atmospheric and surface parameters, as well as remote sensing of sea ice. The improved homogenization and inter-calibration procedure ensures the long term stability of the FCDR for climate related applications. All available raw data records have been reprocessed to a common standard, starting with the calibration of the raw Earth counts, to ensure a completely homogenized data record. The data processing accounts for several known issues with the SSM/I and SSMIS instruments and corrects calibration anomalies due to along-scan inhomogeneity, moonlight intrusions, sunlight intrusions, and emissive reflector. Furthermore, the inter-calibration model incorporates a scene dependent inter satellite bias correction and a non-linearity correction to the instrument calibration. The data files contain all available original sensor data and metadata to provide a completely traceable climate data record. Inter-calibration and Earth incidence angle normalization offsets are available as additional layers within the data files in order to keep this information transparent to the users. The data record is complemented with radiometer sensitivities, quality flags, surface types, and Earth incidence angles. This is a Fundamental Climate Data Record (FCDR). Reprocessed L1B data from the Advanced Scatterometer (ASCAT) on METOP-A, resampled at full resolution (SZF). 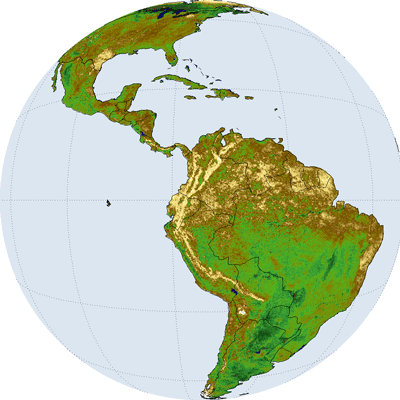 Normalized radar cross section (NRCS) of the Earth surface together with measurement time, location (latitude and longitude) and geometrical information (incidence and azimuth angles). The prime objective of the Advanced SCATterometer (ASCAT) is to measure wind speed and direction over the oceans, and the main operational application is the assimilation of ocean winds in NWP models. Other operational applications, based on the use of measurements of the backscattering coefficient, are sea ice edge detection and monitoring, monitoring sea ice, snow cover, soil moisture and surface parameters. This product is also available at 12.5 and 25 km Swath Grids. This is a Fundamental Climate Data Record (FCDR). 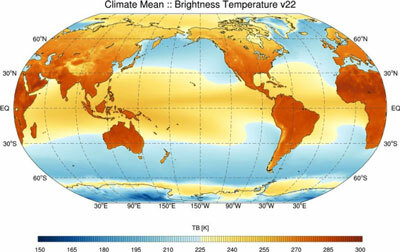 This Thematic Climate Data Record (TCDR) provides Land Surface Temperature (LST) derived from the Meteosat Visible and InfraRed Imager (MVIRI) on board the Meteosat First Generation (MFG) and the Spinning Enhanced Visible and InfraRed Imager (SEVIRI) onboard the Meteosat Second Generation (MSG) satellites. The covered time period ranges from January 1991 to December 2015, thus includes MFG 4 to 7 and MSG 1 to 3. Original thermal radiances were inter-calibrated by the European Organisation for the Exploitation of Meteorological Satellites (EUMETSAT) using the High Resolution Infrared Radiation Sounder (HIRS) as a reference. The LST is derived from Meteosat by use of single-channel LST retrieval algorithms suitable to generate LST data across Meteosat satellite generations. This TCDR includes two different LST products: the Statistical Land Surface Temperature product generated with a statistical LST retrieval approach and a Physical Land Surface Temperature product based on radiative transfer calculations. 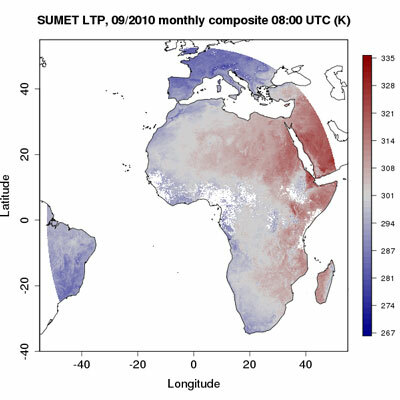 The LST is presented as hourly data and as monthly averaged diurnal cycle composites on a 0.05°x0.05° grid covering the entire Meteosat disk (Africa and Europe). A summary of the retrieval algorithms is provided by Duguay¿Tetzlaff et al. 2015. Along with the data, a comprehensive documentation including user guide, algorithm descriptions and extensive validation studies, is given. This is the first release of the reprocessed SEVIRI Atmospheric Motion Vectors at all heights below the tropopause, derived from 4 channels (Visual 0.8, Water Vapour 6.2, Water Vapour 7.3, Infrared 10.8), all combined into one product. Vectors are derived by tracking the motion of clouds and other atmospheric constituents as water vapour patterns. The height assignment of the AMVs is calculated using the Cross-Correlation Contribution (CCC) function to determine the pixels that contribute the most to the vectors. An AMV product contains more than 30000 vectors depending of the time of the day. The final AMV product is BUFR encoded 3-hourly at every third quarter of the hour (e.g. 00:45, 01:45 ...). Note that the reprocessing was done using the latest version of the EUMETSAT software (Version 1.5.3, 2013) ingesting original level 1.5 SEVIRI images and the ECMWF ERA-interim as a as a forecast input re-analysis data. This is a Thematic Climate Data Record (TCDR). The first edition of the SEVIRI cloud property dataset has recently been generated and released by the EUMETSAT Satellite Application Facility on Climate Monitoring (CM SAF). The CLAAS dataset contains cloud properties at various processing levels from pixel-based data (approx. 4km spatial resolution) to daily and monthly averages (0.05° x 0.05° latitude-longitude grid). In addition, spatially resolved monthly mean diurnal cycles (0.25° x 0.25°) and monthly histograms (0.05° x 0.05°) are available. Input to the retrieval schemes were inter-calibrated effective radiances of Meteosat-8 and 9, allowing the current version of the dataset to homogeneously span 8 years from 2004 to 2011. Along with the data, a comprehensive documentation of the algorithms used, the generation of the dataset as well as validation studies and user guidance are available, with a brief summary given in Stengel et al. (2013). With this dataset, small, regional and large scale cloud processes at temporal scales of hours to years can be studied. Subsequently to the derivation of the cloud properties, surface albedo (pentad and monthly means) and radiation budget products are inferred (daily and monthly means). Products covered by this are: Cloud Mask, Cloud Fractional Cover, Cloud Top Parameters, Cloud Optical Thickness, Cloud Phase, Cloud Liquid Water Path, Cloud Ice Water Path, Joint Cloud property Histogram, Surface Albedo, Spectrally Resolved Irradiance, Solar Surface Irradiance, Direct Irradiance, Solar Net Surface Radiation, Surface Outgoing Longwave Radiation, Surface Downward Longwave Radiation, Surface Net Longwave Radiation, Surface Radiation Budget, Cloud Forcing Longwave, Cloud Forcing Shortwave. This is a Thematic Climate Data Record (TCDR). The assigned DOI for this dataset is: 10.5676/EUM_SAF_CM/CLAAS/V001. Reprocessed L1B data from the Advanced Scatterometer (ASCAT) on METOP-A, resampled at 25 km Swath Grid (SZO). Normalized radar cross section (NRCS) triplets of the Earth surface together with measurement time, location (latitude and longitude) and geometrical information (incidence and azimuth angles). The prime objective of the Advanced SCATterometer (ASCAT) is to measure wind speed and direction over the oceans, and the main operational application is the assimilation of ocean winds in NWP models. Other operational applications, based on the use of measurements of the backscattering coefficient, are sea ice edge detection and monitoring, monitoring sea ice, snow cover, soil moisture and surface parameters. This product is also available at full resolution and at 12.5 km Swath Grid. This is a Fundamental Climate Data Record (FCDR). Ten-day composite surface albedo in the Meteosat VIS band at pixel resolution. The Meteosat Surface Albedo (MSA) product contains an estimation of surface albedos and corresponding uncertainty acquired under direct (black sky albedo) and perfectly diffuse (white sky albedo) illumination derived from observations acquired by the Meteosat First Generation (MFG) radiometer in the VIS band. This product is derived from any archived MFG observations, i.e., starting in 1991 (Meteosat 3) for the longitude 50 degree West mission (ADC) mission. The MSA product is derived in the Meteosat VIS band every 10 days at the VIS pixel resolution, i.e., about 3 km. The HDF4 format is provided as a tar file with albedo (around 150MB) and ancillary (around 570MB) data included. This is a Thematic Climate Data Record (TCDR). Note: The associated geolocation file should be downloaded from the Online Resources under the Categorisation tab. This Thematic Climate Data Record (TCDR) provides cloud fractional cover (CFC) derived from the Meteosat Visible and InfraRed Imager (MVIRI) on board the Meteosat First Generation (MFG) and the Spinning Enhanced Visible and InfraRed Imager (SEVIRI) onboard the Meteosat Second Generation (MSG) satellites. The covered time period ranges from January 1991 to December 2015, thus includes MFG 4 to 7 and MSG 1 to 3. Original thermal radiances were inter-calibrated by the European Organisation for the Exploitation of Meteorological Satellites (EUMETSAT) using the High Resolution Infrared Radiation Sounder (HIRS) as a reference. 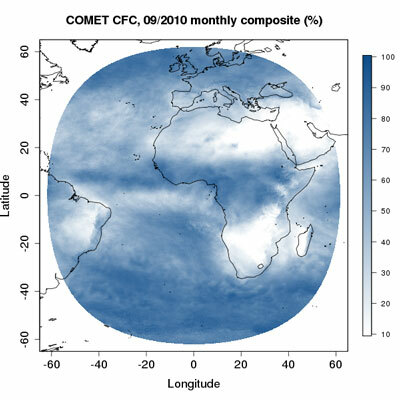 The Meteosat CFC is presented as hourly, daily and monthly composites on a 0.05°x0.05° grid covering the entire Meteosat disk (Africa and Europe). The CFC data is derived from two Meteosat heritage channels by use of an advanced Bayesian retrieval algorithm. It employs continuous cloud scores, which are built on a contemporaneous clear sky background inversion. The Meteosat CFC is characterized by comparability to the SYNOP-based long-term CFC observations carried out at WMO ground stations. 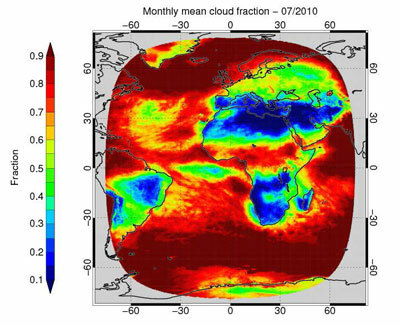 The Meteosat CFC is therefore useful to supplement the ground-based CFC estimates in areas with low station density or high spatio-temporal CFC variability. Along with the data, a comprehensive documentation including user guide, algorithm descriptions and extensive validation studies, is given.